I had the pleasure of fishing with Tom Aurella, and his friends Phil Hart, and Brett Shearer this last Saturday. Fishing was not as "steady" as I would have liked it to be but we managed a good pick throughout the day, once we located where the browns were holed up. We dropped a few fish but did manage some very nice browns including one that was well over 16lbs! Couldn't convince them that the fish was probably worth a trip to the taxidermist, but none the less they went home happy with a bunch of fillets. BTW we caught the monster brown on a noodle rod, with only 8 lb test! GREAT JOB GUYS! Hope to see you later in the year for Staging Salmon. Fishing in Henderson remains strong. A lot of boats from other ports south of us are making the trip up between either Drowned Island and Stoney Point to get into some of the great fishing we have been having. Most fish are still in really shallow. 2.5 - 2.8 knots has been the best speed. Browns are taking a mix of both warrior spoons and challenger stick baits. To try something different we even went up into Chaumont and got into some real nice Northern Pike action. We had Bob Pacquin Group out this past Saturday and Sunday. 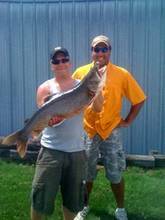 These guys fished with me before last year, brown trout fishing and once again booked about the same time this year. In the morning the browns were in shallow taking Warrior "Vampire" spoons, and also some stinger spoons in gator and sunkist. Fish were in 10- 20 feet of water. Had a great time with these guys all great sportsman and alot of hunting stories were swapped during the two days of fishing. 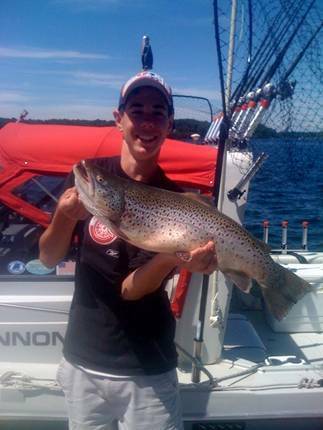 The "second" big brown was good enough for the Captains Pro Purse in the brown trout division. Caught some great fish...both browns and lakers. Hope to see you guys real soon again! We had the great opportunity to work with my good friend Briggs Williamson of Mega Bite Charters (also in Henderson) to take a group of young men out from Camp High Hopes. These guys all met us at Henchens Dock and the two boats (Excursion and Ghost Dog) headed out for some trout out along the High Rocks. The weather had turned for us and was very cold and windy, but we stuck it out and got everyone a few fish until we were all blown off the lake. 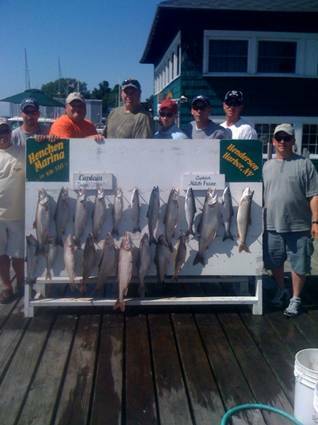 We caught a mix bag of both Lakers and Browns as well as a Steelehead to add to the excitement. The fish caught came both off the riggers and also the planner boards. 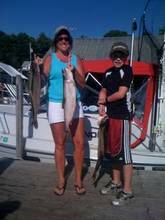 Excursion Charters was out this last weekend for the Walleye opener. We were greeted by a flotilla of boats in Black River Bay. So we instead headed up into Guffins Bay to try and find some quiet water to fish. We immediately set in and started catching some huge bass and some pike. According to the radio there were not alot of 'eyes being caught. It was a bright sunny warm day, hardly a ripple...not exactly ideal conditions for Walleye, but we tried. On Saturday we fished with good friend and fellow Captain Tim Meador of Lots of Limits Charters and Guide Service. Tim was also experiencing a tough bite, too. We ended up catching a few northerns and some pre-season bass that were released but no Walleyes. We had the distinct pleasure of fishing with Gary Haywood, and some friends of his from Hawaii. We had another beautiful day, caught lots of fish, and lost a monster Walleye (the one that got away) off the back of the boat. Mike made his annual trip up to the lake to fish browns over the weekend. We could not asked for any better weather especially after all the wind we have been experiencing this spring. Saturday we found the fish tight to the shoreline, bringing the boards as tight as only a few feet of water, where Mike caught this "bute" thats heading for the wall! Later in the day the fish moved off into deeper water. A few fish were caught on Stick baits, but most were on stinger spoons, in natural colors.....the "Vampire" was the best. Mike and his crew were true sportsman catching and releasing all the shallow water numerous lake trout we caught. Sunday we went out and the lake was flat calm.....no clouds. Caught one descent brown, but then it was like someone flipped a switch.......the fish I think were still around but certainly not biting like the day before. We had a couple other strikes during the day but that was it. We called around to ther boats in the area and they indicated the same thing. Big Blow on the mighty Lake "O" on the 13th, churned the water up to look like chocolate milk, and screwed up the water temperature on April 14th. 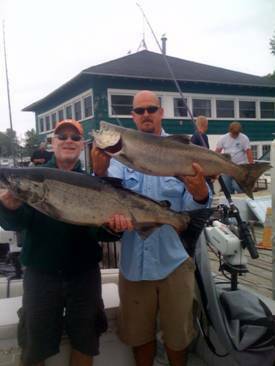 We fished alongside good friend Tim Meador of Lots-A-Limits Charters and caught only five (5) fish the whole day. Everyone was struggling. The forecast this week is for sunshine and light and variable winds (mostly). This should set things up for improved fishing as this stable weather pattern dominates, setting up temperature, baitfish, and hopefully the browns. Trout fishing for Browns, Lakers and Steelhead has remained exceptional this year, especially of the lighthouse on the finger. Limit catches so far this year have been the norm….not the exception. We recently took 4th place in the local derby the last week of July. 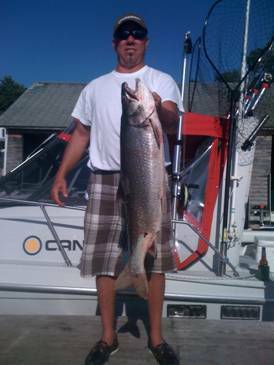 “Bucky” won a fabulous Labatt refrigerator, and a Okuma Rod and Reel worth thousands! Over the weekend the strong south and south / southeast winds have pushed the salmon into the trench. Yesterday (8/15/10) the trench was full of fish from the pump house all the way up to the lighthouse. Flasher flys were best trolling very slow. Below are some of our customers with there catches. I like seeing everyone come back year after year with me, and even the new faces. It’s been a blast!! NOW LETS GO RIP SOME LIPS and catch some SALMON! Fishing has been very steady the last few weeks. The trout fishing remains very good! The “mature” salmon are getting hard to come by. A lot of juevinule / jacks being caught but not the nice large Kings we were catching just a few weeks ago. A lot of bait in the area I’m fishing. I just think it will be a matter of time before the big salmon find this bait and the bite will be on again!! 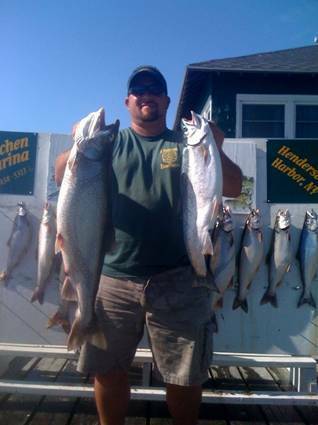 Most fish are coming off the lighthouse and the haystack in 150 – 110 feet of water. Spoons in both Warriors, Stingers and NK’s are all working! Had several parties over the past weekend from Modular Comfort Systems, and Dominic (Nick) Avetalla. 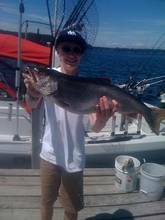 All parties experienced some great fishing for trout and salmon. A lot of Rod action!! You know what they say….a picture is worth a million words. And yes we are still catching steelhead as well!! Most of the action was off the wall in front of the Stoney Point lighthouse in 110 – 140 feet of water. There is a lot of bait here as well.